We’ve been hearing a lot lately about death and the apparel industry. Last week over 400 factory workers in Bangladesh were crushed and killed when the factory they worked in collapsed on them. This calamity was manmade and could have been prevented. Those mothers and fathers and children were making clothes headed to the global North, to a local store near you. Because they are paid such a low wage by any standard, we can buy new clothes at a price that seems fair to us. We buy them, wear them, then what? Hopefully, you donate them. Clothes donated to charity still have a long road ahead of them. They get sorted, parceled up and literally shipped around the world. The nasty ones end up in bales, tightly vaccum-packed and sold for industrial use as rags. The nicer ones might end up on the rack of your local Goodwill or AmVets. Thank you very much. That’s where I buy most of my clothes. The rest? Well, let’s just say if they had frequent flier accounts they’d earn a lot of miles. Your donated, used apparel gets shipped to India, Eastern Europe or any other number of locations to be re-sorted, re-baled and shipped by the thousands of tons to the global South. Some of it ends up as calamity clothing. In the 1990s, used clothing was sent to Mozambique as charitable donations following a long string of natural and manmade disasters. It became known in Portuguese as roupa de calamidades, clothes from calamities, or simply calamidades. The term is still used and simply refers to secondhand clothing. Most Africans, including Mozambicans, purchase their clothes from secondhand clothing markets. The vendors purchase the specific clothing items in bales by the kilo. Remember, this is clothing that, at some point, was donated by you or me to our local thrift store. That’s the global economy at work. Would you like 20 kilograms of used T-shirts to resell? How about 10 kilos of bras? That’s how it’s done. Once they are purchased, they are likely to be worn to shreds. After a long, smelly, stuffy trip across the globe, this is the end of the line. There is a great debate over whether or not secondhand clothing is stifling the growth of the apparel industry in Africa. If you’re interested in reading a scholarly article on the issue, read “Unravelling the Relationships between Used-Clothing Imports and the Decline of African Clothing Industries,“published last year. Or, if you’re like a lot of people, where your clothes come from and where they go is not of major concern. Should it be? 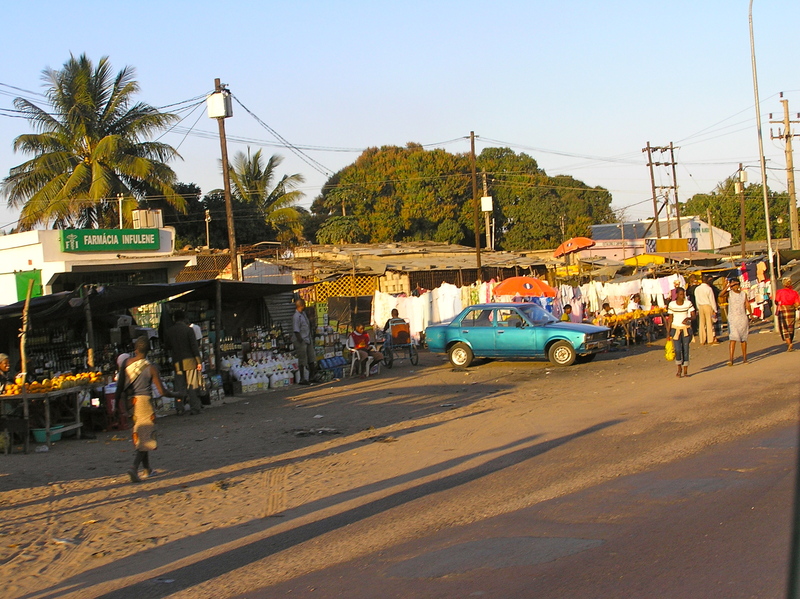 A variety of calamidades being sold along the road in Maputo, Mozambique. For a humorous and enlightening look at the clothes shopping experience in Mozambique (and a little more about the journey secondhand American clothes embark upon), read the post Bom Dia, Mozambique! : The Second Life of the American T-Shirt, written by a Peace Corps volunteer living in rural Mozambique. It’s an entertaining read with excellent pictures included. Hi, I need to get in contact with someone in Maputo who sell These used tshirts can you perhaps help me? I’m sorry, I don’t know anyone personally in Maputo who sells them. They are usually sold in bales to individual vendors who sell them at open air markets. The vendors usually have cell phones, but not necessarily email. I don’t know any of the vendors personally in Maputo. Are you looking for an individual vendor or the company that imports and then sells the bales of clothes? Feel free to contact me directly at willtravelwithkids at gmail dot com. Sorry I couldn’t be more help!